On the morning of July 20, 2015, Cuba officially opened its Embassy in Washington, D.C., and the United States did likewise in Havana although the ceremonial opening of the latter will be on August 14 when Secretary of State John Kerry goes to Havana to preside that event. Prior posts discussed the ceremonial opening of the Cuban Embassy and the joint press conference later that day at the U.S. Department of State by U.S. Secretary of State John Kerry and Cuba’s Foreign Minister Bruno Rodriguez. This post reviews the extensive July 20 comments about the U.S.-Cuba relationship by White House Press Secretary Josh Earnest. A subsequent post will review the reactions to these events. 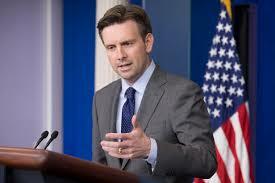 The Press Secretary said he did “not have a specific commitment in terms of when [a nominee for U.S. Ambassador to Cuba] would be announced or who that person would be. We certainly do believe that U.S. interests in Cuba would be best represented by somebody serving as the ambassador there.” Later in the conference, when pressed, he said despite anticipated resistance to the appointment of anyone to that position by some Senate Republicans, he expected such an a nomination to be made by the President. The “current Chief of Mission is a gentleman named Jeffrey DeLaurentis. He is somebody who had previously served as the Deputy Assistant Secretary of State for the Bureau of Western Hemisphere Affairs. He is somebody who has done two previous stints at the U.S. Interests Section in Havana, and somebody who has served in a wide variety of diplomatic roles, including as the political counselor to the U.S. Mission at the United Nations in Geneva, a political counselor at the U.S. embassy in Bogota, even did a stint here at the White House at the National Security Council. U.S. Leverage To Effect Change in Cuba. White House, Press Briefing by Press Secretary Josh Earnest, 7/20/15. I think that the cultural influence the States will exert in a more accessible Cuba will be profound, and that it will eventually have a good effect on the character of the Cuban government. It’s specifically the ‘time-capsule’ quality of Cuba’s regime that has made its old-style communism feasible. Susan, thanks for the comment.